Ariel’s family requested a very specific color palette and theme for her Bat Mitzvah invitations. 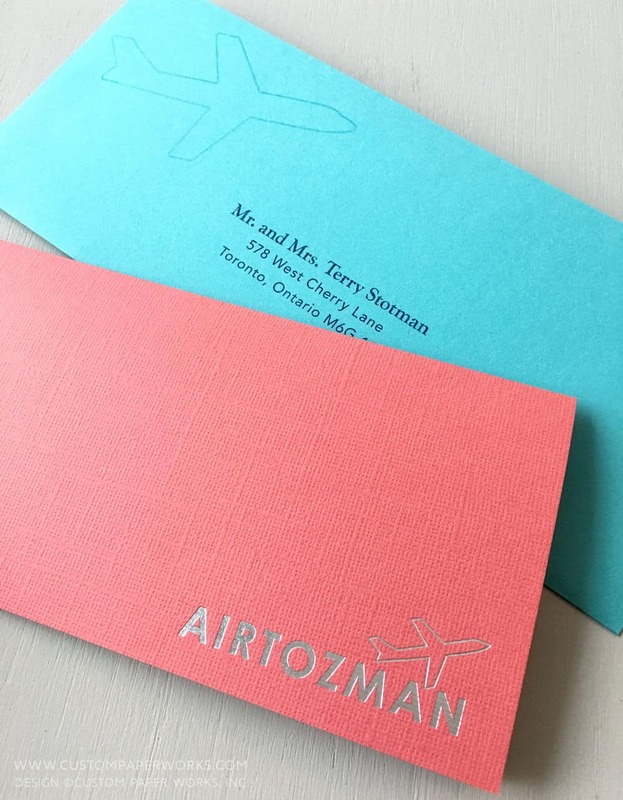 They had already decided on creating a faux airline brand, and using a simple logo and tail of an airplane as the main artwork on the boarding pass cards. It took a bit of searching to find the right shade of coral for the boarding pass folder wrap, and it happened to also have a gorgeous linen-like texture. It was a beautiful contrast with the silver foil-stamped logo. One of the things done differently here at Custom Paper Works is NOT having a fixed list of papers. 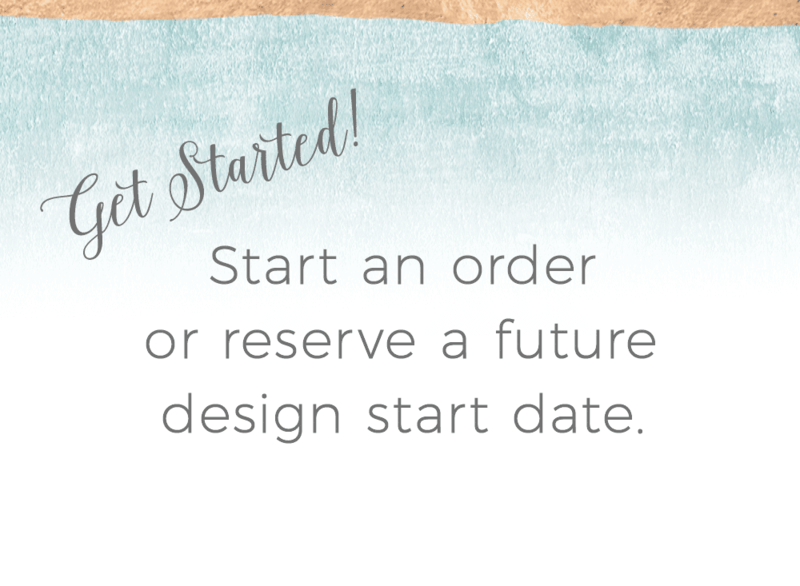 This is because papers are ordered specifically for each client anyway – so you can ask for “coral” – and see ALL the coral paper options we can find from dozens of stationery-grade paper brands and suppliers. After all, “coral” can refer to any shade from a deep hot redish orange to this bright festive shade of almost-pink. 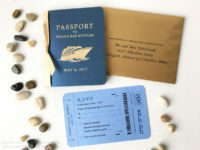 The main boarding pass plane ticket card was used for the traditional ceremony details. 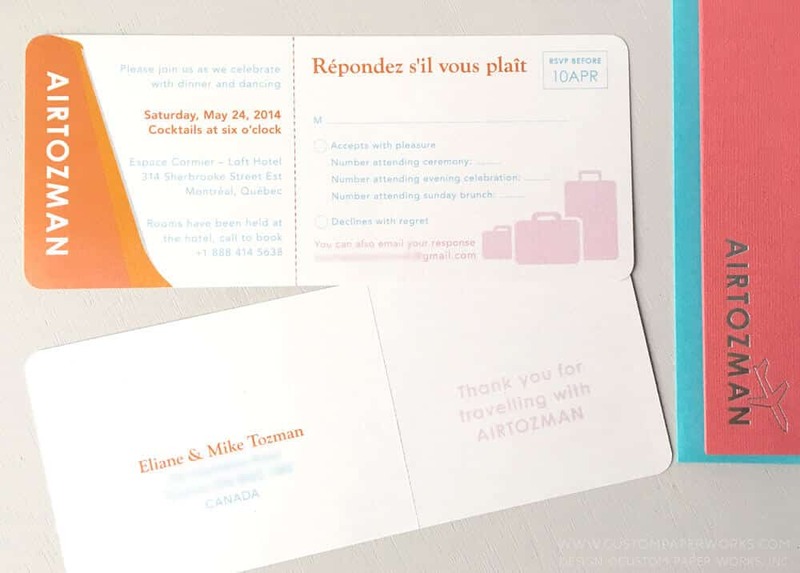 The second boarding pass had a tear-away rsvp postcard on one half, and the evening reception details on the other. An entirely separate invitation could be sent for the Sunday brunch, which is a fine option if only a handful of families are invited. But when 20 or more families will be invited a related event, it can get more costly to do a separate mailing, especially once postage is added – with mailed rsvps, the postage cost alone would be about $1 per invitation. I’d personally rather add another “WOW element” to the existing invitations than spend extra $ just on postage. So we created an additional “skinny ticket” as the Sunday brunch invitation. Only the families invited received that part of the set. Then, two versions of the RSVP cards were printed. The first had rsvp options for the ceremony and evening reception. The second version had spaces for the ceremony, reception, and Sunday brunch rsvps. 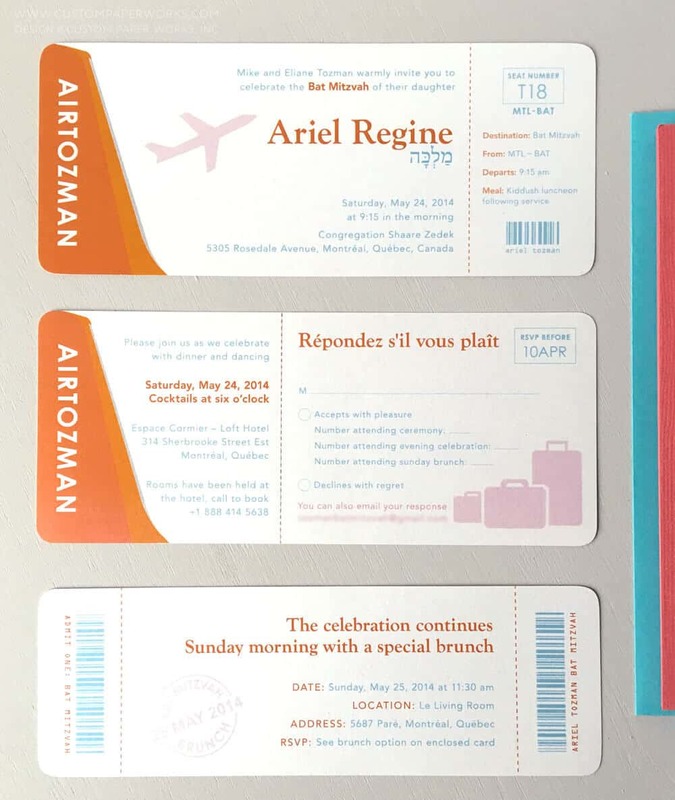 How can we customize your travel theme Bat Mitzvah invitations?